I had my check up on Wednesday (1st August) and Dr Seri gave me MC starting Friday. Actually I aim to request my MC starting next Monday (6 August) but she said I hit my 38 weeks that Friday, so she can give me starting 3rd August instead of waiting for coming Monday. Wohooo! Feeling so lucky to get MC without asking for it. I can plan my MC by...sleeping!!! Hehe. I've done nothing on Friday. Just light laundry and space out some mess on the floor. Sleeping till 3.30pm. Yer..kurus puasa hari tu. I am really over pampered myself that day and told Hubs I don't want to cook. Ah..I am just so lucky to have a Husband that is not fussy and kind for letting me being as lazy as I want. Haha! Even so, I still have a bit of guilt everytime I overpampered myself. 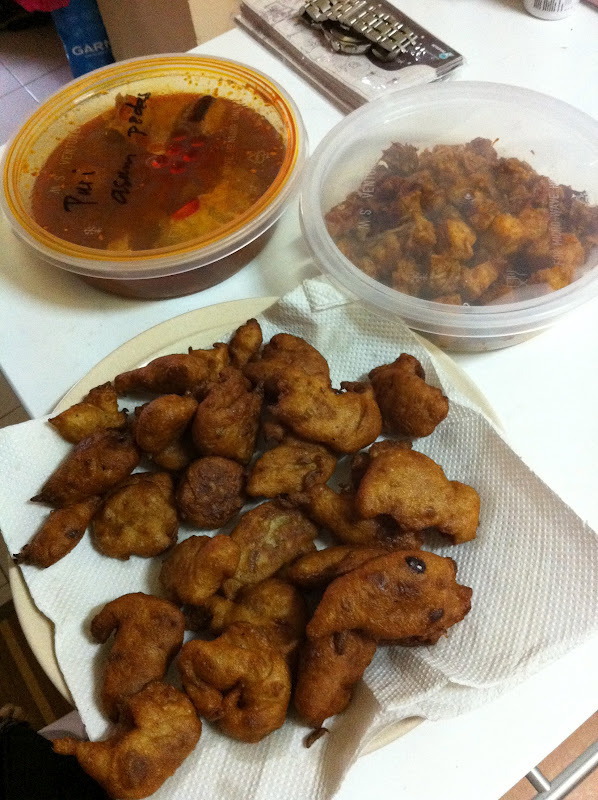 So I made him Cucur Lepuk Durian, lepuk from Ma's posted by Kimah with love. Ewah. I never made one or even eat this kind of cucur before this. Hubs cakap buat same macam cekodok dan yer memang same pun. Rupe pon same. Rase je durian. Sedap woh! The next day we planned for buying Raya's cloths for Hubs. Well, actually new cloths for him. Top to toe for his prezzie. Then berbuka with Shima at somewhere near her house. So much planning on Saturday. I even planned to fold cloths, doing laundry, ironing Hubs working attire and all those house chores but..BUT..there's bad cramp down there. Thinking it just might another false alarm, I wake up at 11am, went to toilet and start doing my first chores - folding the cloths. I messed the whole cloths in front of TV, as what I always did, and it took me more that half hour to finish quater of it. The pain for so bad that I barely moved. Still, thinking it was just another cramping, I went to bed and lie down. Told Hubs about the pain and he's asking if I want to go to the hospital but I told him that the pain was the same pain that I had previously which ends within an hour, so I said no. I wait and wait but the pain didn't go away. Instead, it becomes more frequent than before. Unsure what was happening and I just can't bare for it anymore, I told Hubs 'Jomlah' and off we go to PCMC. We reached ER around 2pm, wait for a minute or so for registration. It was really a laid back situation. There's no drama like in those movies where people rush with wheel chair and running for the labor room. I even walked by myself to the registration counter (unlike the accidence experience where there's someone already waiting for us upon stepping into ER door and bring the wheel chair to me). We think that we already bring all the necessary stuff but we notice my purse is not with us, even my handphone and my check up book wasn't there upon reaching at ER. Out of so many things - my IC and insurance card was no where to be found. Aigoh.. but luckily the ER just need my name and DOB to entertain us. The lady at the counter make some calls for confirmation and informed one guy to bring me to labour room. We reached in one room which at that time I just thought it's just a normal room for check up. A nurse came and put one of the device to check my contraction. She leaves us for 10 minutes to see the results. At this moment the pain is so excruciating that I can't even speak. The interval was about 1 minute each, still I wasn't thinking I'll about to pop the baby out. The nurse came back and check there's no contraction shown from the device but said she'll check again for 10 minutes. Again, after that, no contraction shown. Therefore she asked if I wanted to go home first and wait after breakfasting to check again but I refuse cause I can't stand the pain. Therefore, to confirm if I'm about to deliver, she checked my opening and it's already 6cm!! She quickly rushed out and called Dr Seri. Later on, different nurse which I will always remember her name, Nora, came to prepare my delivery. She asked if I need epidural but I refuse and instead she offer some gas for reducing my pain, but still I refuse. Wah gagah gitu konon nak tahan sakit. But end up she gave me the gas as she saw my pain was so obvious, most probably from the face. Haha. Nora checked again my opening and it's already 8cm. Hubs was suprised (so do I) that it was so quick. Nora was being so calm and helpful during this time as she advice me to a lot of things. She guide on how to breath, to push and what not to do when I was about to pop out. Not long after, Dr Seri came with her cheerful voice saying 'Ain, cepatnya! I baru jumpa you last Wednesday kan?'. A lot of talk going on and everything was so peaceful and calm. So calm that I don't remember how long does it take to push the baby out. Hubs was standing next to me all the time. Nora was giving her guide and support through out the delivery. Hubs absence really help me go through it. He first said nothing but when I was about to give up as I don't feel confidence that I can push the baby out, he started to voice out 'Dear, nampak kepala dah dear. Tahan sikit. Push lame sikit je lagi'. Ya Allah, at that moment, I feel there's some force helping me to hold my breath and push it for another round or two. I feel it's just a minute or so until I deliver my baby. I remember saying 'Astaghfirullah' at the moment Nora put my daughter on me. I was about to cry and I think that is the only moment that I remember there's a small tears for happiness :) I safely delivered out our daughter at 3.30pm at 3.43kg. The last check up was 3.3kg. A matter of few days to gain 100g. She probably could reach to 4kg if I deliver at 40 weeks, said Dr Seri but no matter what, I am grateful for what's comes. A healthy baby is all that matters. As such, we introduce you, our new bundle of joy, Rauhah binti Muhammad Hafiz. congrats ain!! nak nangis baca pengalaman ko hehehe emo kan! anyway selamat hari raya to u & family!